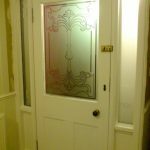 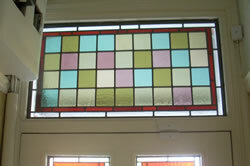 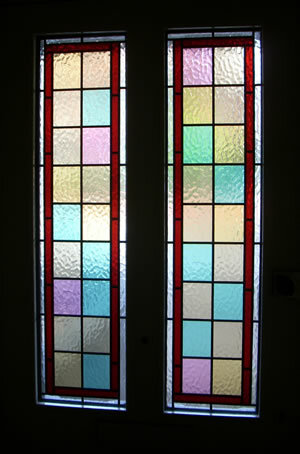 The two door pieces of coloured square lead door glass (below) were ordered by a client who wanted to match the glass in the door with the original top lite above the existing door (pictured right). 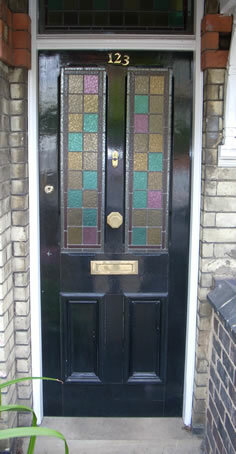 We searched through hundreds of different colours to match in with the original fanlight and achieved a 99% likeness. 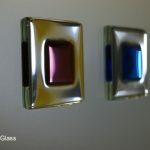 The colours on the top lite look a little bit darker on the photo but this is due to the different amount of light coming through the glass when the photo was taken. 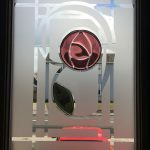 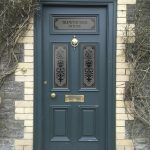 The decorative leadwork was created using ‘Option B’ Design onto Minster from the frosted glass page and this helped create a very authentic look for the front door glass. 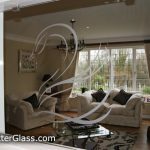 The door glass was sealed into a 14mm double glazed toughened glass sealed unit with a Pilkington K energy saving glass used for the backing glass. 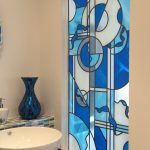 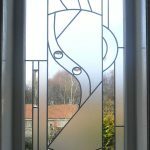 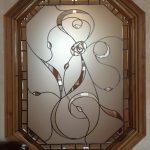 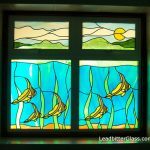 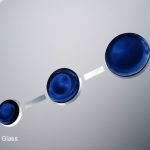 The lead used for the door panels was ‘Option 4’ Aged & Soldered from the leaded glass page and again, this helped create an authentic style of overlay stained glass. 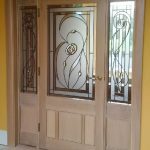 In our standard gallery we have some similar designs and you can see how these types of designs will look on your specific door colour by visiting our Split Glazed Coloured Door designs.